On an episode of the Suze Orman show a caller had bought a Rolex watch and she commented how she'd been told that the Rolex would be a good investment. My wife and I laughed at the idea that a luxury watch was an investment. It was a little shocking to hear someone claim that. But much to my surprise I'm more shocked to find out she wasn't too far off base. New Explorer II Rolex watches are priced about $6,200 - $6,300 on Amazon.com. Thats just one price sample but good enough for my purposes. I checked out eBay and find Explorer II's selling for a range around $4,000 and up. But it seems that older versions of the Explorer II style also sell for similar prices. The resale value of a Rolex model doesn't seem to vary too much based on the age of the watch. So a 10 year old Explorer II is going to fetch a similar price to a 20 year old or 2 year old watch. In the 1970's you could have bought a new Explorer II for around $400. If you can resell that same watch today for $4,000 then thats a 10 fold increase in value over 40 years. That equates to 5.9% annual compound growth. The site Minus4Plus6 has a table showing the price evolution of Rolex models over time. I took the prices for the 17 watches with the longest history of at least a couple decades and figured the annual growth rates. The average annual growth increase of the Rolex watches I looked at was 7.7% and the median was 7.3%. The low was at 4.9% and the high at 12%. 10 of the watches increases 7-8% range. In general looking at the price appreciation of the Rolex models it seems that a 7% annual increase in value is fairly typical. 7% annual increase is pretty good really. But there are various downsides to such a collectible investment to consider. In order to do well with any collectible you have to know what the items you're collecting. The same is true with a Rolex watch. I personally know very little about Rolex watches so if I were to go buy one as a collectible theres a good bet that I would buy a watch that isn't as favorable and doesn't retain its value as well. I might over pay for the watch when I buy it. 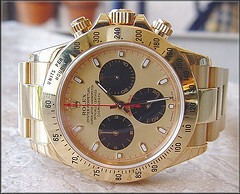 If buying used you also have to be aware of forgeries when dealing with an expensive luxury item like a Rolex. To succeed financially with a collectible you have to know the items well. One big 'gotcha' about the investment value of a Rolex is the cost of servicing. A Rolex may very well last a lifetime but the mechanism may need periodic servicing or repairs over the years. That cost can be significant. Having your watch serviced or repaired by a qualified shop can cost several hundred dollars. A couple service or repair bills over 20-30 years can turn the net present value of a Rolex from positive to negative. I'd consider a Rolex to be semi liquid. You can probably run down to a pawn shop and sell any Rolex within a day. So in that regards its a pretty liquid item. But while you may be able to sell a Rolex quickly but you won't necessarily be able to get a good price for it. To get a good price you may have to take some time selling the watch. As an individual it may be hard to sell a watch for top dollar and you may have to settle for a price a bit below the real market rates in order to sell it within a reasonable time frame. Technically a Rolex that sells for more than you paid would be a collectible item that is taxable. When you have a gain in value of a collectible it is taxed at regular income tax rates. Most investment vehicles like stocks and bonds pay a more favorable capital gains tax rate. I doubt most people will actually claim such a gain on their taxes either because they aren't aware its taxable or because they think they can get away with it. But such a gain IS taxable so that should be a consideration. Overall a Rolex is not a 'horrible' investment. The 7% typical growth in value is actually fairly good. But if you add in the details like service and repair costs, expertise to succeed, lower liquidity and income tax implications the investment in a Rolex is not as good as what you should expect with stocks or bonds. Bottom line : Rolex' investment value should be considered a secondary benefit of buying the luxury watch brand and not a primary reason for a purchased.